For many many years I left my stinky outside. It finally gave up on me. I almost ordered another but decided against it because rarely do I have anyone join me when smoking and I also wanted to change things up. I looked around at options for a bit and nothing jumped out at me. So, I just happened to polish off a bottle of Blantons Bourbon and it dawned on me that the empty makes a perfect ashtray for single cigars. I don't even have to dump it, I just cork it when I finish using it. Anyone else have any cool home made or free ashtrays? I hope you got to use it first. Just swipe a hubcap off your neighbor's car. The ground always works for me. The one I use the most is an old earthenware flower pot. Holds up to extreme heat, rain, wind, frost and holds a lot. What's not to like? My dad buys them for me at garage sales. I have some vintage beauties thanks to him and he's never spent more than $3. I guess I'm spoiled. 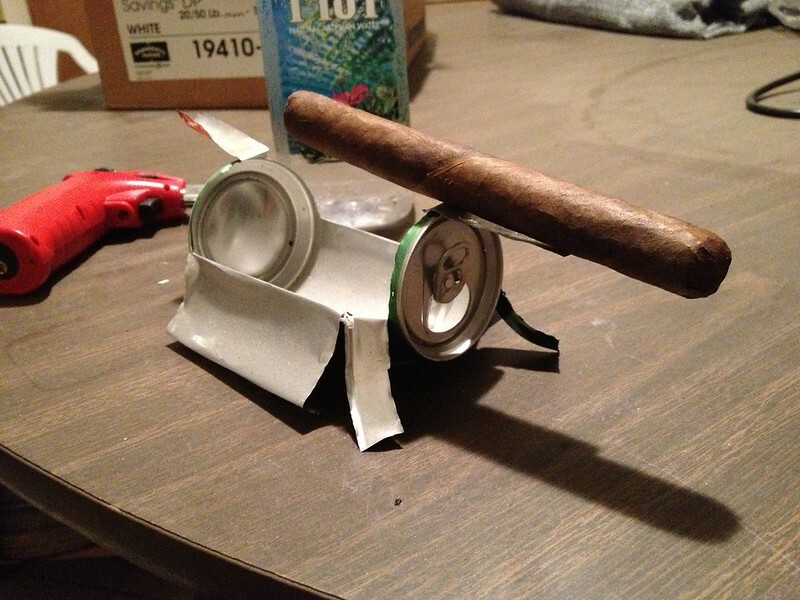 Your talents are being squandered on cigars and soda cans! You are just returning the cigar to where it came from. Good ole mother nature. I too have a stinky that has seen better years, I normally ash on the ground then throw my butts in the Garden. That's cool. They are biodegradable and the birds love to use them as part of their nests. When we lived up north, birds would take the butts right out of my ashtray on the table on the patio. The world is my ashtray! I just ash on the ground outside and toss my butts in an empty Tim Hortons can I have outside for cigar and cigarette butts. If you smoke outside and don't truly need a place for the actual ash, this might be a good budget alternative. Mine is in the mail so I cant comment on quality, but perhaps others can?